The eye will be anesthetized with eye drops during surgery procedure. The operation is painless. During surgery, the eyelids are kept apart thanks to a small instrument called an eye speculum. Step 1: The corneal flap is created in the superficial part of the cornea with the first laser (Femtoseconde Intralase® laser). The laser has an effect of about 20 seconds. Step 2: The corneal flap is placed over so that the treatment is performed using the Excimer VisXS4IR® laser in the thickness of the cornea (the hood remains fixed on the cornea with a hinge). 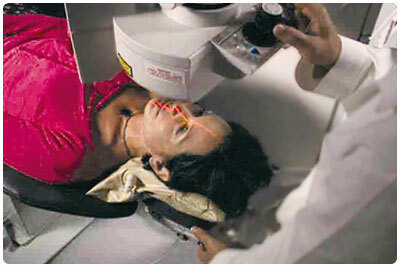 Then the eye surgeon performs the laser reshaping treatment in order to remove the defect(s) of vision. The correction procedure is completely guided by a computer and controlled by the surgeon. The laser treatment procedure takes about between ten seconds and one minute depending on the importance of the defects of vision. Once i-LASIK® treatment has been performed, the corneal flap is repositioned to its initial place. It naturally sticks by capillarity in only a few seconds. No surgical blade is used. The procedure takes about ten minutes for both eyes. The patient can return home very quickly after control by the eye surgeon.